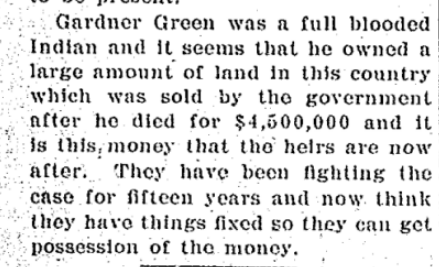 In 1907, the town of Moberly, Missouri was abuzz with excitement over some of its citizens being heirs to a fortune. 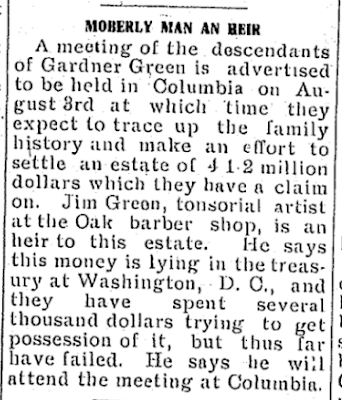 According to Jim Green, an heir and tonsorial artist at the Oak Barber Shop, the descendants of Gardner Green were gathering in order to try to settle an estate worth 4 1/2 million dollars that they had a claim on. He said the money was in the U.S. Treasury in Washington D.C. and they, the family, had spent several thousand dollars trying to take possession of it but had, thus far, been unsuccessful. Moberly Weekly Democrat, Moberly, MO, July 26, 1907, p.3. Other articles made it abundantly clear, this was the same Green family who had unsuccessfully tried to gain citizenship in the Cherokee Nation in 1896. 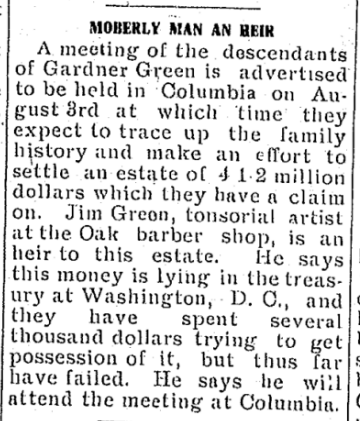 They were trying to "take possession" of an estate they insisted belonged to their purported ancestor, a Cherokee named Gardner Green. Moberly Weekly Democrat, Moberly, MO, August 6, 1907, p.6. It's unclear why the Green family claimed they were heirs to such a large fortune, but their story evolved over time and changed into something more shocking and nefarious. 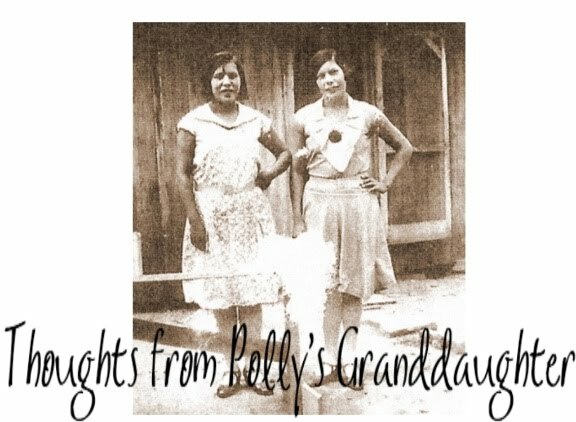 They no longer claimed to simply be heirs to a fortune, but instead, claimed to be a tribe called the "Eastern Cherokees" and that they, the descendants of Gardner Green, alone formed what was called the "Eastern Cherokees." They also claimed Congress appropriated four and half million dollars to them for their shares of the Cherokee land taken in the east. Moberly Weekly Monitor, Moberly, MO, August 25, 1908, p.3. We know, for certain, that the Green family were not heirs to the money the U.S. Court of Claims awarded the "Eastern Cherokees" in 1906. That money was owed to the Cherokees for unpaid funds due them from the forced removal. Those funds were to be paid out per capita to Cherokees and/or their descendants who were entitled to them. To make this point perfectly clear, the money the United States paid was for the entire citizenry of the Cherokee tribe who remained in the eastern homelands until after the Treaty of New Echota. The term "Eastern Cherokee" did not strictly apply to the modern day Eastern Band of Cherokee Indians, though it did include them. "Eastern Cherokee" certainly did not indicate descent from the Cherokee scholar named Gardner Green by the Moravians. Even if it would have, the Green family from Missouri were not his descendants. From the first post in this series, we already know that the Gardner Green listed on the 1835 Census of the Cherokee Nation was actually Young Wolf, son of Mouse. We also know that Young Wolf died in 1837, leaving only two heirs, his wife, Aley, and young son, Ooahhusky. His estate, valued at $383.50, was divided between his two heirs in 1838. 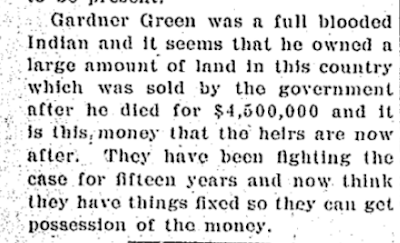 The Gardner Green Estate claimed by the Green family of Missouri was fictitious. Therefore they were false heirs. 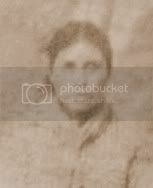 From the second post in the series, we know that the Green family from Missouri who claimed descent from the Cherokee Gardner Green could not have descended from Young Wolf. Even though they failed in their attempt to gain citizenship in the Cherokee Nation in 1896, eleven years later, the same family again tried to claim Young Wolf as their ancestor in order to try to get money. The next post will explore the documents filed by the Green family in their attempt to obtain their mythological fortune. Stay tuned for more on Young Wolf, his legacy, and what we can learn from it all.